Review : Welcome Back - Bhagwaan Ka Diya Sab Kuchh Hai! Ab Bas Esi Filmo Ki Hi Zarurat Hai! 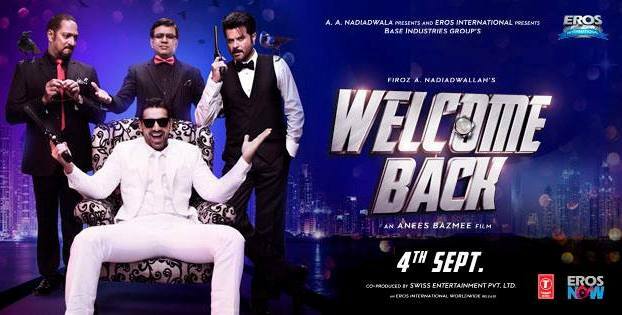 Review : Welcome Back - Bhagwaan Ka Diya Sab Kuchh Hai! Ab Bas Esi Filmo Ki Hi Zarurat Hai! Home > welcome back review > Review : Welcome Back - Bhagwaan Ka Diya Sab Kuchh Hai! Ab Bas Esi Filmo Ki Hi Zarurat Hai! Review : Welcome Back - Bhagwaan Ka Diya Sab Kuchh Hai! Ab Bas Esi Filmo Ki Hi Zarurat Hai! Star Cast : John Abraham, Shruti Hassan, Nana Patekar, Anil Kapoor, Paresh Rawal, Dimple Kapadia & others. Story Line : Uday Shetty and Majnu Bhai have left the underworld, and are now big businessmen. Two women, Chandni and Maharani, enter their life. Chandni is the new love in Uday Shetty and Majnu's life and both friends dream of tying the knot with her. However, Appa - Uday's father, plays spoilsport by bringing in his other daughter, Ranjana. He tells Uday Shetty to get her married to someone from a good family. Maharani puts a condition that only after her sister is married, than only Chandni will marry one of them. Now, a search to find a suitable husband for Ranjana starts. What's Good : Awesome comedy with full of action, It's serisouly silly and maybe very good than the previous film. Screenplay and dialogues are quite impressive. The film won't let you feel boar, storyline keeps you connected with the film. Nana Patekar and Anil Kapoor are just fabulous in the movie. John Abraham has did his job perfectly and other actors too have performed very nicely. What's Bad : Songs are boaring. Climax scene is just extra! It's damn silly and idiotic just full of siyaapa! Do you remember De Dana Dan's climax scene? Welcome Back's is extra than that one! Our Opinion : Story is very good and comedy is really fantastic, movie might have a little bad points but, the story will fulfill your expections! It's worth for your money! Don't waste your time and go book tickets for your family!